Our FB47 box measures 5 1/8" x 1" x 5 1/16". 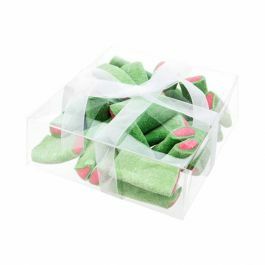 It's a crystal clear box that is ideal for holding a 5" x 5" product, such as card sets, napkins, or collectibles. Provides an excellent display for the retail environment. Easy assembly. Stickers are included, to purchase additional stickers click here to see our full list of sticker options. Our FB47 box measures 5 1/8" x 1" x 5 1/16", making it perfect for packaging 5 x 5 inch products. This 12 mil box holds 5" x 5" products like greeting cards, thank you cards and invitations, up to 12 sets. 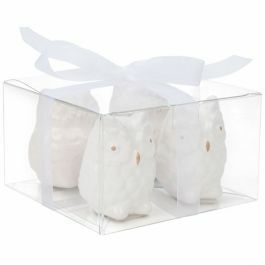 Works great for party favors, napkins, and keepsake items. Dress up this box with a splash of color with a 14" vinyl or elastic stretch loop. Boxes are easy to assemble and come with clear stickers for a more secure closure. Ships and stores flat. Great for the retail environment. 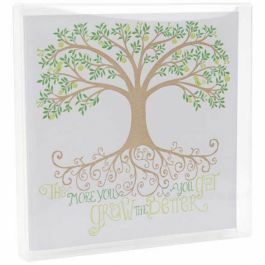 Outer Dimensions: 5 1/8" x 1" x 5 1/16"
Most popular use is for 5" x 5" envelopes and cards (set of 12).